Last week I went shopping with Maestra. You guessed it – I bought couple of nail polishes. One of them is Revlon – Autumn Berry. 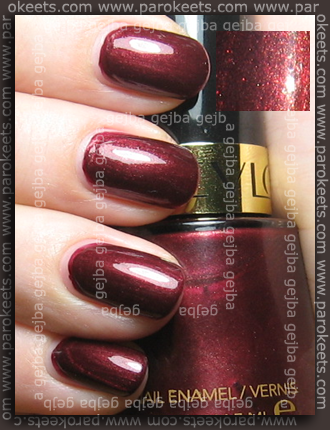 It is beautiful reddish-violet based polish with green, red and gold shimmer. I needed two coast to achieve even coverage. Bad news was, that I had tip wear (as you can see it on my index finger) the same day I applied it even though I used top coast. But that won’t stop me from using this lovely shade again in the future. Čudovit!! Nohti pa še bolj :) a ta je z Ilirije?